A previously unknown population of at least 100 lions has been discovered by a wildlife charity in a remote park in north-western Ethiopia. Born Free Foundation said it had obtained camera trap images and identified lion tracks in the Alatash area close to the border with Sudan. The area is thought to have lost all its lions in the 20th Century because of hunting and habitat destruction. 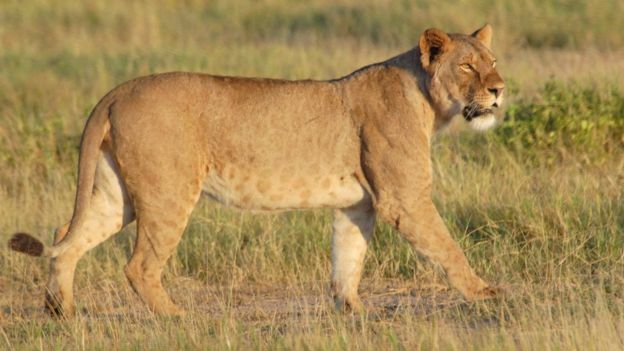 The lions are thought to be of the Central African sub-species, of which only about 900 were thought to survive, Born Free Foundation’s programmes manager, Mark Jones, told the BBC Newsday programme. “Even though the team only visited the Ethiopian side of the park because of logistics, lions were likely to exist in the larger, adjacent Dinder National Park across the border in Sudan,” he said. Dr Hans Bauer, a renowned lion conservationist from Oxford University, who led the expedition, said this was the first time that the presence of lions had been confirmed in this area. He estimated that the area could host a population of 1-200 lions. The discovery will be good news for wildlife campaigners in Africa, where experts say the number of lions in West and Central parts of the continent is rapidly dropping. “It is an important finding because knowing where the lions are will help us work with local people and wildlife authorities in order to improve protection and education around why lions are important and why it’s important to protect them,” Mr Jones added. Last year, a study by the International Union for Conservation of Nature, says “many lion populations are either now gone or expected to disappear within the next few decades”. The killing of Zimbabwe’s famous lion, Cecil, by an American dentist last year sparked global outrage.